What are Numbers & Operations in Base 10? There are two parts to this standard. 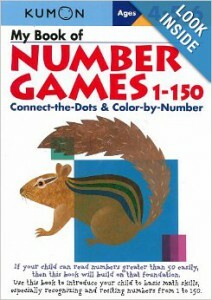 The first is a basic understanding of the place value of numerals in any given number. We refer to this as base 10 because each number has 10 times more value than the digit to the right. For example, in the number 24, the 4 is also known as 4 ones while the 2 has 10 times the value consisting of 20 ones. I hope this makes sense! 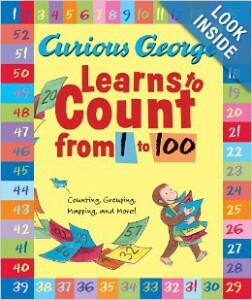 Understanding numbers in Base 10 also consists of skip counting and comparing two or three digit numbers using greater than, less than, and equals to while looking at the number in the tens or hundreds place. 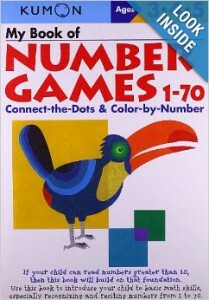 When should I start teaching my child Numbers & Operations in Base 10? I would start as soon as they can count to 10. I think the most common way I have seen this modeled in a classroom setting is with straws during calendar time. A teacher will put a straw in a bucket for every day they are in school. Once there are 10 straws, they get bundled together with a rubber band and placed in a separate 10s bucket. 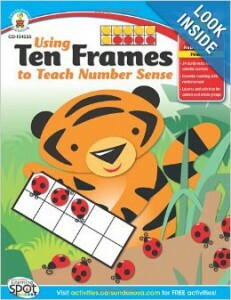 What resources are available to help my child learn Numbers & Operations in Base 10? There are actually lots of resources to teach this concept to your kids. I have to admit I am pleasantly surprised- I was expecting this to be a shorter post due to lack of resources but I am wrong! Here is a list of Numbers & Operations in Base 10 literature that I came up with! 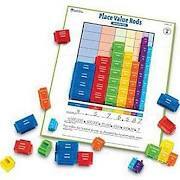 Here is a list of teacher resources and manipulatives that can help you teach your child place value. We have done a couple activities in the past that can be tweaked to include the math standard Numbers and Operations in Base 10. Addition Towers with Unifix Cubes: At the time we were just working on very simple addition. To turn this activity into more of an educational place value experience, don’t make the towers with both addends. 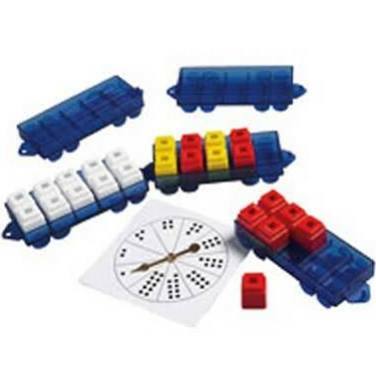 Take the loose unifix blocks and group them into “ten towers” while finding the sum. 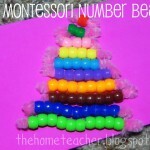 DIY Montessori Number Beads: So this would need lots of tweaking. Choose one color for your beads. Make 10 bead sticks with pipe cleaners with 10 beads on each stick. Or you could spend a gazillion dollars and buy some awesome golden beads from a Montessori store. OK so they aren’t a gazillion dollars but when you can make something similar for free paying ANYTHING just doesn’t make sense. 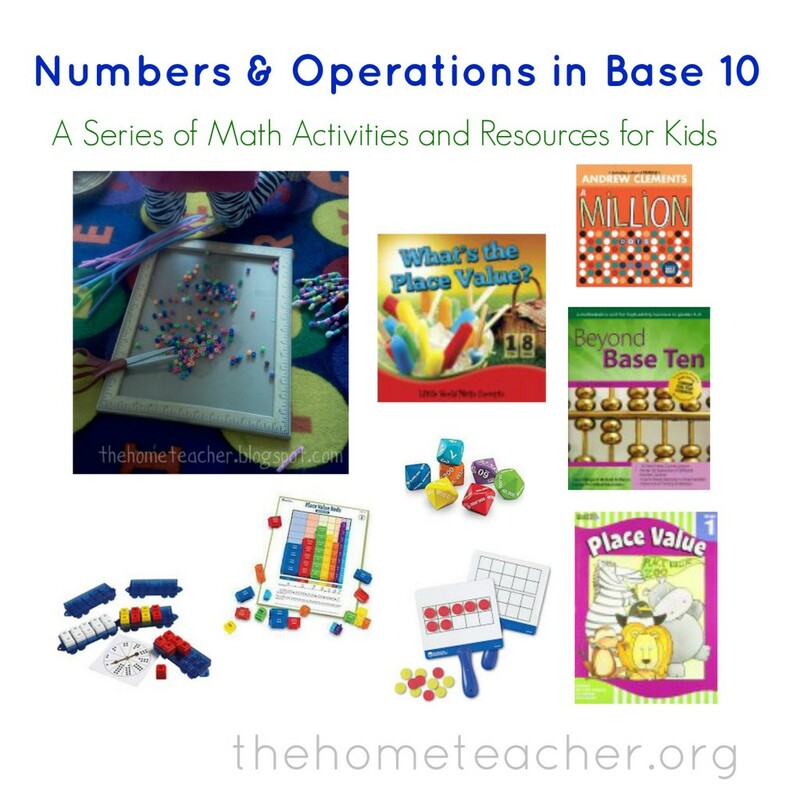 Here are some activities and idea for Numbers & Operations in Base 10 from around the web! 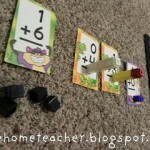 Boy Mama Teacher Mama shared a fun Ten Frames game to do with your kiddos. She has a set you can purchase or you can download some seasonal ten frames. I am putting this activity on my list of things to do with my Boo! Naturally Educational posted an activity using coins to skip count. Love the idea to use money! I will be writing another Numbers & Operations post soon- but instead of being Base 10 stuff it will be all about fractions. Alright- blog post is done which means the laundry must begin! Yay for me? 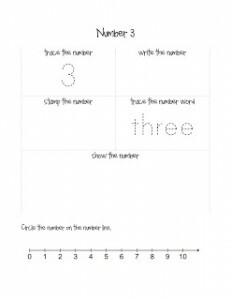 This entry was posted in math, Number Sense and tagged base 10, learningtime, math apps, math literature, number sense, numbers, place value on January 8, 2014 by ktoponce. 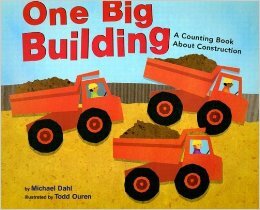 This week I will be centering all my posts on MATH- more specifically: counting & cardinality, operations & algebraic thinking, numbers and operations in base 10, measurement and data, and geometry. 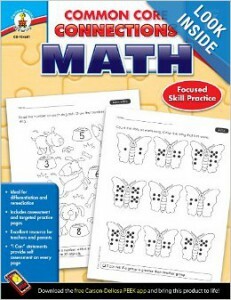 For those familiar with the Common Core Standards these should look very familiar! 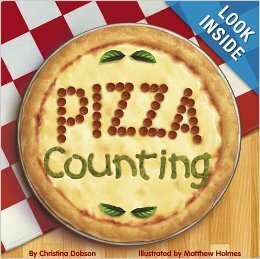 With my daughter in kindergarten this year, and with the possibility of me teaching school this fall, I thought it would be good for me to immerse myself in the current math curriculum. In this post I will share with you what I have learned about these different math standards and some activities that you can do at HOME with your kiddos! So let’s get started on our math adventure! What is Counting & Cardinality? 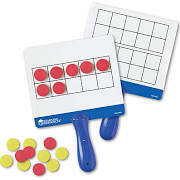 It is the ability to know, write, understand, group, count, and correctly use numbers. This is an important academic foundation for our little ones to completely master. 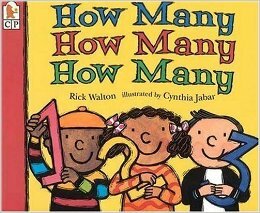 When should I start teaching my child counting & cardinality? As early as possible! 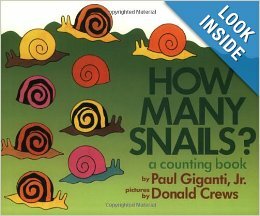 Take every opportunity to use numbers- whether its counting how long it takes for your kiddo to put on their shoes or pointing out numbers in books, signs, and toys… math is everywhere! 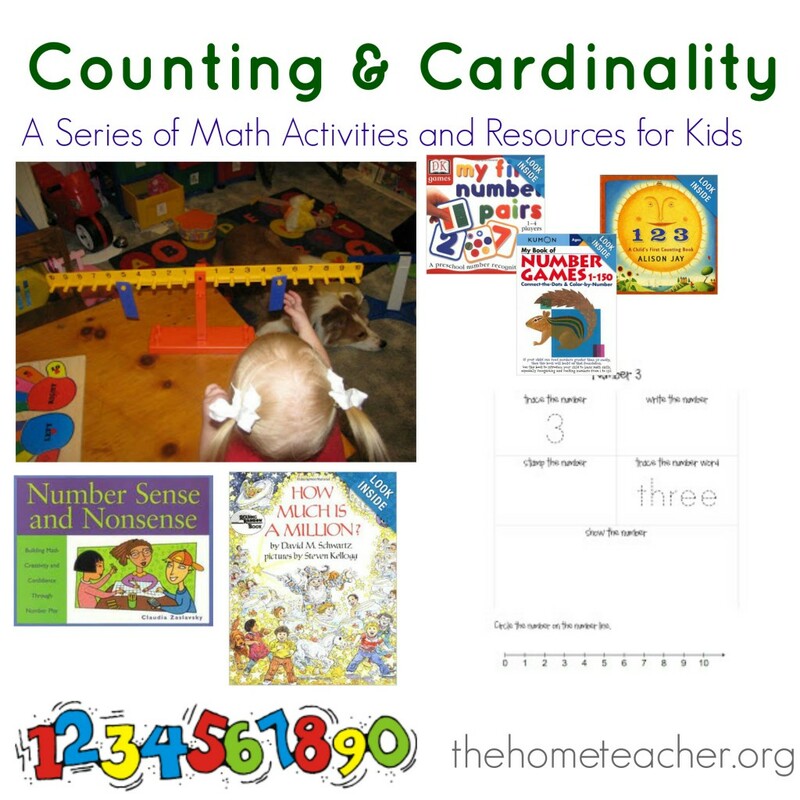 What resources are available to help my child learn counting & cardinality? The resources are endless. Here are just a few! There are some amazing number sense apps available. Native Numbers, Approach to Montessori- Numbers HD, Montessori Numbers, and Intro to Math by Montessorium are just a few of the many that are accessible through android and iTunes. 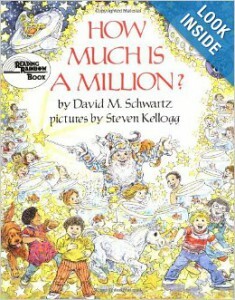 Literature is always a great tool in helping kids understand math concepts. Click on the pic to get more information about each of these books. 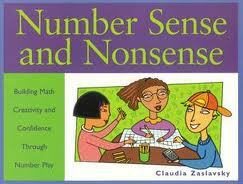 There are also number sense books available for older kids. Teach your child numbers with our Number Day Plans and Free Printables. We had a great time learning numbers using a variety of methods- stamping, tracing, writing, and using stickers to show numbers. 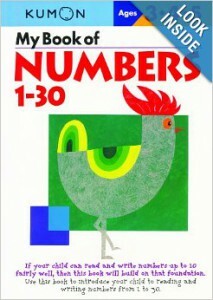 On my wiki I have a number book cover and number pages 0-30 that you are free to download and use. 8 Learning Lessons You Can Use with a Number Scale. I love, love, love our number scale! 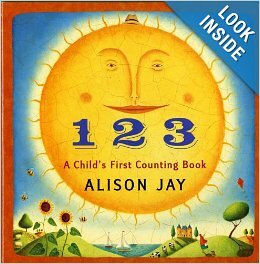 My Boo (who was a toddler at the time) and I had a great time learning number sense with this fun, hands-on educational tool. 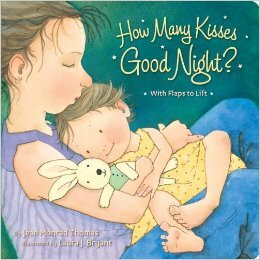 One activity mentioned in our post was a “Count With Me” game. To play you give both you and your tot ten weights. Out loud, count from one to ten together while each of you place a weight on the appropriate side of the scale. 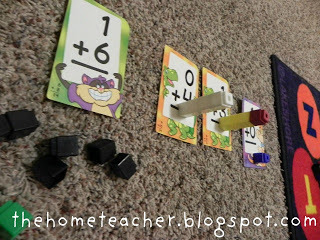 This will help your tot to see the numbers while saying them… it’s a pretty simple activity! Katie from Preschool Inspirations created an interactive calendar with her preschoolers which allow them to become more familiar with number recognition. Chelsey from Buggy and Buddy shared a wonderful way to have calendar time with her 2 year old! See it is never too early to get our kiddos involved in math! Buggy and Buddy also has a WONDERFUL post about Finding Number Patterns Using a Hundreds Chart. 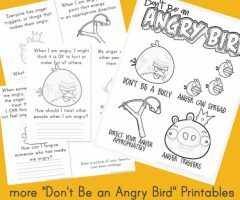 She has included a free printable that I am going to print as soon as I am done typing this post! 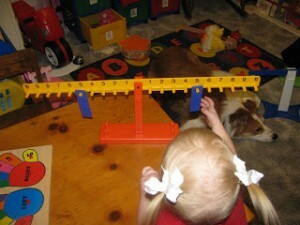 Nadia from Teach Me Mommy posted about Using Playdough to Teach Math. 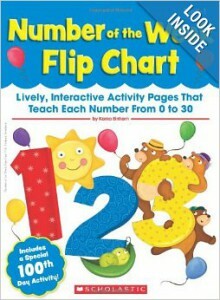 She has some great number recognition activities that are not only educational but fun as well. 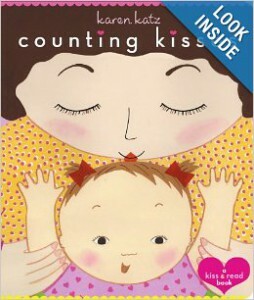 Lalymom shares several different ways to work on counting with your kids. I love that her ideas are simple and things you can integrate into your daily activities. 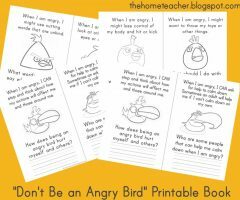 Lemon Lime Adventures has a great post for those who are struggling on how to start teaching math with your kiddos. I especially like her list of math centered questions you can ask your child. 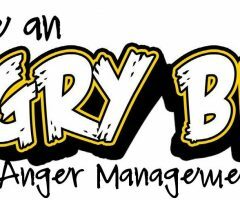 Thanks for this resource Dayna! Debs from Learn With Play at Home had a great idea using paper tubes to teach number recognition and ordering. 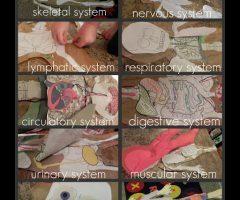 This activity is geared for kids 2 and up… such a fun education craft! She also posted an idea to teach your kids teen numbers with manipulatives, a super cute bowling game to teach number recognition (great for those active little kids! 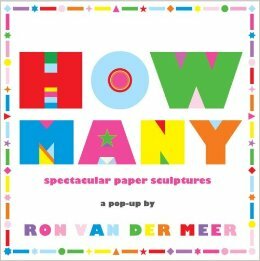 ), making 10 with an egg carton, and 30 Counting Activities to do with Kids. 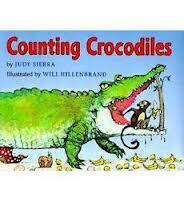 This site is a wonderful resource for counting & cardinality! 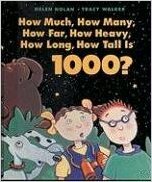 Math Story has some number sense songs (as well as other math standards) with videos and lyrics. Great resource for our music/visual learners. Check out What Do We Do All Day for a Kindergarten Number Matching Game. Great hands on learning activity! 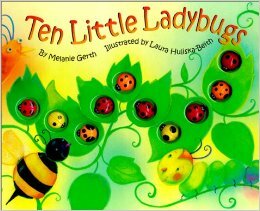 I hope this list is will be a great resource as your are teaching your kids about counting & cardinality. Remember: Math can be fun! And it doesn’t have to be hard or take a lot of time to teach these fundamental skills. 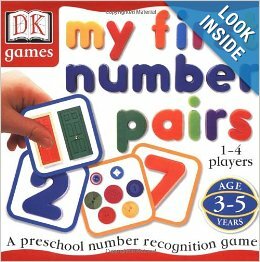 This entry was posted in apps, early learning, math, number days, Number Sense and tagged counting and cardinality, education cubes, learningtime, math apps, math literature, number sense, teaching tools on January 6, 2014 by ktoponce. A couple of days ago, my daughter dumped an entire bag of plastic pony beads all over the craft room floor. Normally I would have been eager to clean them up quickly and put them away, but I was in a good teachery mood and turned this mess into a learning experience! Boo wanted to know how many beads we had. A lesson objective was planned- organize beads in groups of 10 and then count by 10s to see how many beads we had all together. After my daughter used tongs to place beads on a picture frame we had lying around, we started making number bead sticks. I grabbed some pipe cleaners, cut them in half, and added 10 beads to each pipe cleaner. SO EASY! To tie of the end, just twist the wire until the beads can’t come off. We had a great time adding beads and tried our hand at simple patterns. 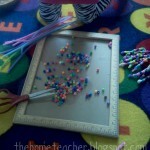 This was also a great fine motor skills activity. There were a couple things I would have done differently during this activity. First- instead of just doing 10 sticks, I would have made 1-9 sticks as well. 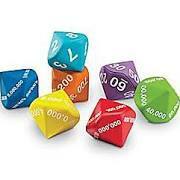 And just like the Montessori number beads, I would have color coded each number stick. For example, all the 10 sticks would be blue beads, all the 9 sticks would be brown beads, etc. Lucky for you, I quickly whipped up an example! 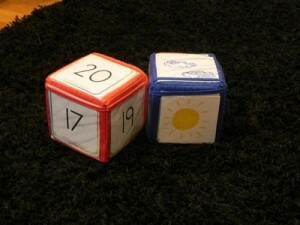 This entry was posted in math, montessori, Number Sense and tagged DIY, numbers on February 27, 2012 by ktoponce.